Displaying 1-5 of 276 result(s). It was great to see everyone at GP7 which was held at Chislehurst Girls’ school on Sunday 14th April 2019. We hope everyone enjoyed both some great chess games and spending time with your friends. U11: In this section there was some strong chess matches played which resulted in four players getting a fantastic 5/6. Again using the buchholz tie-break method the placings were: 1st Aryan Gohil, 2nd Florian Brasch, 3rd Owen Xu and 4th Karl Peters. Well done to all the young chess players who came along, from experienced county players to those at their first chess tournament. It takes a lot of work and willing volunteers to organise a large and successful chess tournament. Thanks go to Jo Wildman (ECF NA) for running the tournament director and arbiting. Also thank to Ganesh Swaminathan, Ben Luo, Patrick Burns and Deepak More for support and arbiting in the playing halls. Also working both before and at the event to ensure we could run a successful tournament were: Kathryn Woodward for liaising with the venue, helping with registration and bringing the catering supplies, Robert Hackman for storing and bringing along the equipment, Ilga Leimanis for organising and ordering the trophies and medals and Sumitra Varma for her technical help with the website and the online registration. We also much appreciate everyone who helped on the catering stall throughout the day. All those that take the time to do a shift are vital to ensure we can continue to provide drinks and refreshments at these events. 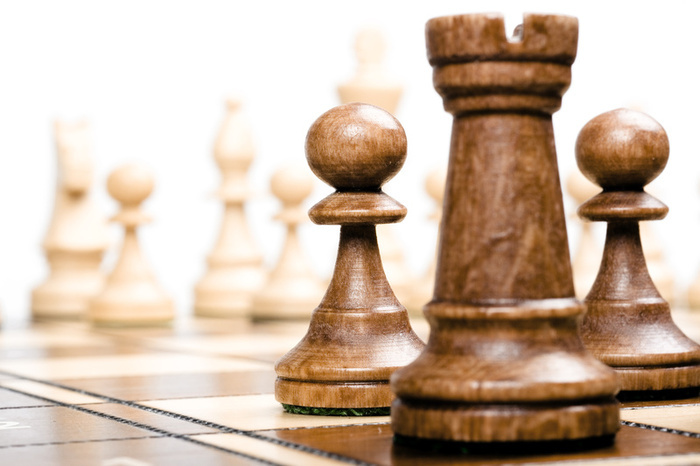 KJCA is run by volunteers to develop chess opportunities for children and young people in Kent and South East London. Our work to support junior chess is only possible due to our volunteer helpers. Please do consider offering some help by speaking to one of the team at our tournaments or contact us via webmaster@kjca.org or directly to Jo Wildman, current chair of the committee, on jowildman@hotmail.com or 07583337307. Finally, thanks go to Chislehurst Girls’ school for use of the fantastic venue and facilities and to their caretaker for all his help on the day. 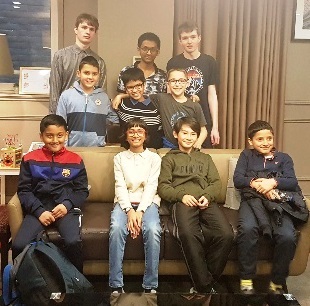 Well done to Kent Juniors, Aditya Verma, Mikey Watson, Shreyas Royal, Jacob Watson, Shlok Verma, Denis Dupuis, Stakhey Sedykh and Nour Ajili who all represented Battersea in a one-off chess match against, Wood Green, the best team in the London league and probably in the country. Wood Green are made up of all GM, IM and FM titled players so it was a fantastic opportunity for all the young players. Thanks to all at Battersea chess club for organising and also to all the Wood Green team for playing, inspiring and supporting the juniors. Congratulations to all the Kent U11 team for winning the EPSCA 2019 EPSCA U11 Finals and becoming the National Champions for the second year running. The finals were held in Birmingham on Saturday 30th March. Most of the team travelled together on the train in the morning. Sixteen teams from across the country qualified for the finals and the competition was expected to be tough. Last year Kent had won the event on tie break after finishing on equal points with Richmond and we expected another very close event throughout the day. The day started well with Kent scoring 17 points from 20 in the first round ending in equal position with Richmond, with Oxfordshire third on 16 points. 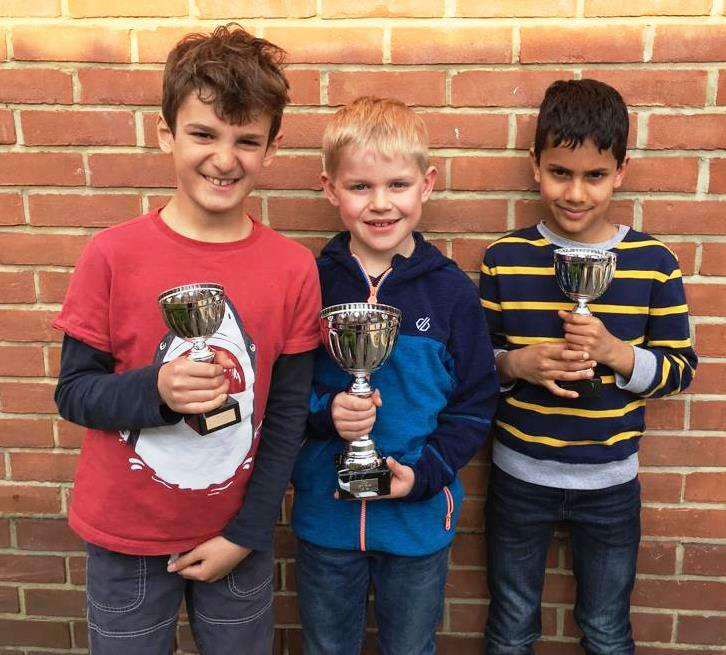 The reserve team played alongside the main team event playing some great chess to win the reserve tournament with a score of 11/12 across four players in a very convincing performance. The full team were Shreyas Royal, James Merriman, Shlok Verma, Dennis Dupuis, Stakhey Sedykh, Lev Mann, Mateusz Bazan, Raghav Vaiyda, Roxolana Chaban, Artemiy Shkuratovskyi,Nour Ajili, Ismail Longia- Zaidi,Shaurya Mehta , Aneesh Sagar, Oli Garett, Xirui Mao, Amit Aryan Sankha,Yifan Luo, Teo Saunders, Rohan Pasari, Roshan Rao, Makariy Shkuratovskyi ,Arman Tengayev and Ankit Gaekwad. Many thanks to GM Chris Ward and GM John Emms and to our team manager John Merriman for their coaching, guidance and support throughout this season. 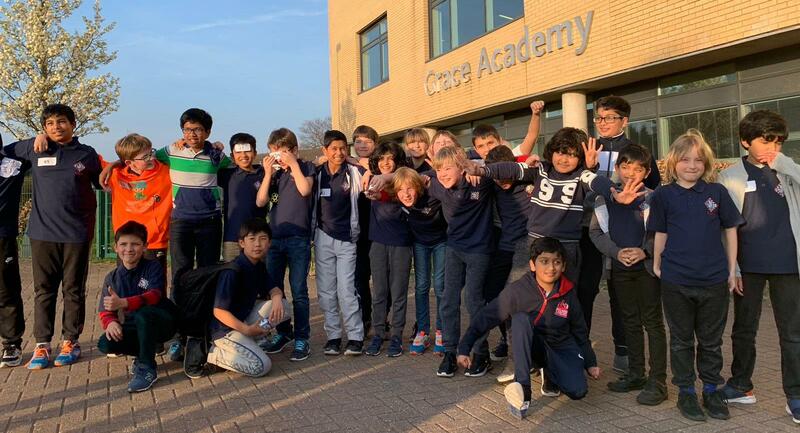 We also appreciate the efforts from all the parents and carers, who brought the children along to both the zonal and the final competitions and continuously support their chess. 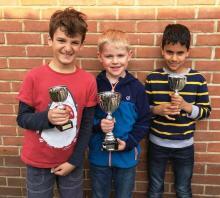 Winning this national event two years consecutively is a great achievement for Kent Junior Chess and the future for these promising young players looks bright. Well done to everyone. The Kent U14 and U18 teams competed in the recent SCCU Janboree which was held at Barnet on Sunday 17th March. Congratulations to the Kent U11 Girls’ team that played in the EPSCA Inter County Finals on 23 March 2019 at Grace Academy in Solihull. 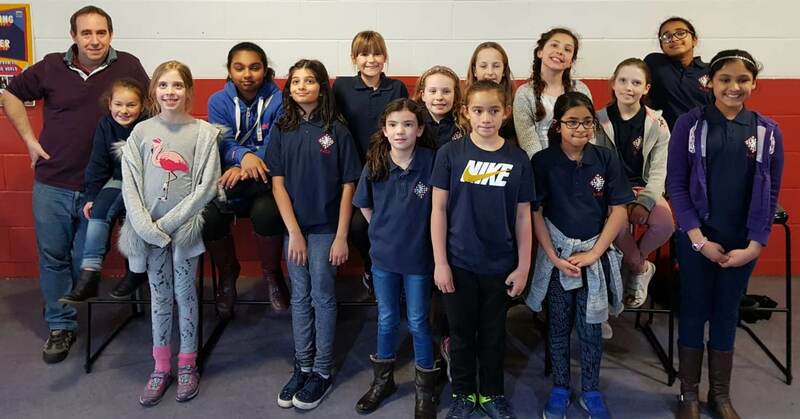 The young team of Roxolana, Vaidehi, Anya, Tessa, Nikita, Krisha, Violet, Scarlet, Alina, Georgina, Chloe, Aoife, Grace and Maitreyi played some determined chess and all enjoyed the day. Particular mention goes to Scarlet and Alina who both won all their games. However, all the girls gained points and should be proud of their efforts over a long day. Thanks to our Coach GM Chris Ward whose enthusiasm and words of wisdom sustained the team throughout the day. Also a big thanks to our retiring Girls team manager, Andrew Bruce, who has led the girls for a number of years and expertly supported, arranged travel and inspired the teams over this time. All at KJCA are grateful for his time and efforts to support our young chess players.